“’To scandalise is a right; to be scandalised is a pleasure,’ says Pier Paolo Pasolini (Willem Dafoe) in the opening scene of Abel Ferrara’s Pasolini. 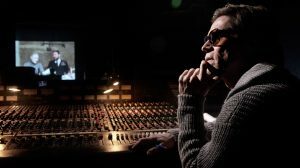 Dafoe’s voice is measured, but his eyes are wide, as if they’re trying to drink in the whole world at once – and within 24 hours of this moment, the celebrated poet and director of Teorema, Accattone and Arabian Nights – will be dead. Lying face down on the beach near Ostia, he’s the victim of a roaming gang of thugs who catch him in the dunes with a young, male lover. The film’s opening words are Pasolini’s, but it’s a credo that Ferrara – the director of Driller Killer, the original Bad Lieutenantand last year’s veiled Dominique Strauss-Kahn biopic, Welcome to New York – has hungrily lived by.